i have four boys...this means i have a lot of hand-me-downs, a lot of clothes to store. 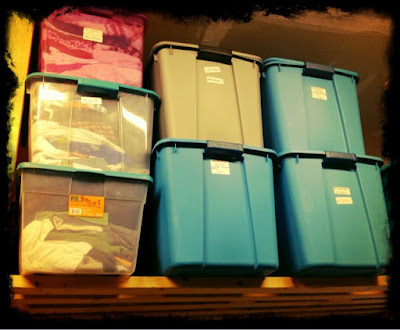 when we first moved into our current house (a house that has zero storage space...literally), we had a storage system built in our garage to store all of the clothes we are passing down from child to child. thanks to a ton of plastic, labeled tubs, we are pretty organized and we never have to start from scratch for any children but the first two, the oldest boy and the one girl. trust me, that saves a ton of money. we are also super thankful for hand-me-downs from friends. start one pile at a time. it's kind of ridiculous, but when i open up a tub of clothing, i get instantly sentimental. i'll pick up a cute outfit and picture each of my children wearing it and remember the stage they were in. if i tried to do all of the sorting at once, i'd be a mess. start small and try not to get overwhelmed. work when the kids aren't around. whatever you are going through, clothing, toys, baby items, etc., go through them all when the kids are away. i can't tell you how many items had not been played with for a year...until i tried to get rid of them. then all of a sudden, the items became the things that could not be lived without. my daughter has also cried buckets as her favorite old outfits are packed up to give away. there is much less drama if the sorting is done alone. garbage: every time i open a tub of clothes, i'm amazed at some of the things i have chosen to keep. seriously...tennis shoes that have gone through two little boys already? what was i thinking? as hard as it is, make a garbage pile. some things are just not worth keeping. selling: make a second pile of things you can re-sell. there are countless kids' consignment sales out there. i am selling a ton of stuff at one this week. it is a lot of work to get everything together and tagged correctly but i've managed to make some cash off of our things that we can no longer use. do a search for consignment sales in your area and get selling. you're not making any money off of the things sitting in your garage. sentimental: third, make a sentimental pile. this needs to be small. i have one or two things from each kid. they are usually items with their names on them or the outfit they wore for their church dedication. keep this pile as tiny as possible. trust me, your kids probably won't want any of the clothes they wore as children for their own kids. it's just going to collect dust. charity: the fourth pile is the "give away" pile. as long as the clothes are still in pretty good shape, give them to a local charity. if you're not in the mood to do a consignment sale, this pile might be very large. if things are just sitting unused in your garage, give them to someone who will wear them everyday. while you are at it, go through your own closet and find some unworn items as well. for myself, i find it hard to justify keeping something i haven't worn in a year when there are people who need it and could use it on a daily basis. used clothing can be a huge blessing. take the time to take pictures of what you are donating and to itemize these items for your taxes. you'll be surprised at what a difference this will make on your taxes each year. only keep what is necessary. i know that we all want our kids to have nice things. sometimes, though, i feel like we all get caught in the "have more stuff" phenomenon. do i really need two princess bikes on the off chance that a friend comes over to play? probably not. again, this goes along with the principle that there are people less fortunate than ourselves who don't have one bike. do i really need to be holding on to two bikes "just in case"? definitely not. i am learning to look at our things from a different perspective. if a good friend lost everything in a fire, would i immediately be able to find things we could live without? definitely. it's probably safe to say that i don't need all that stuff to begin with and that i could certainly stand to get rid of some extras. get it out of the house...fast. the longer i sit with stuff, the more likely it is to be reincorporated into our daily lives. package things up right away. put things into large, black trash bags so you can't revisit the items inside. stick them in your car to take away as soon as possible. purging does a household a ton of good. it can open up space, de-clutter storage, and be a blessing to someone else...all in one big clean up. try it...one plastic tub at a time.